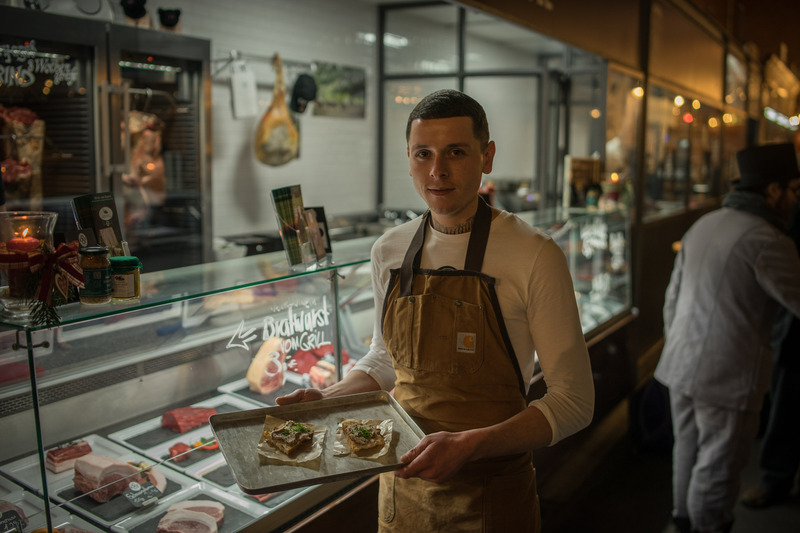 Kumpel & Keule is the new and hip Berlin butcher with a ground-breaking focus on quality and transparency. 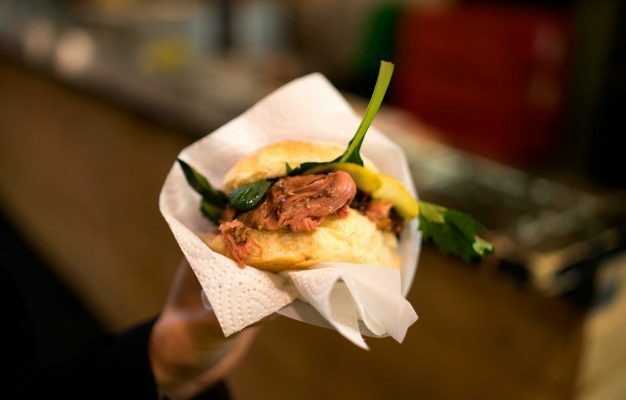 Located in the Markthalle Neun in Kreuzberg, this is not only a great place to buy meat but also a prime spot for a grilled sausage, burger or steak. 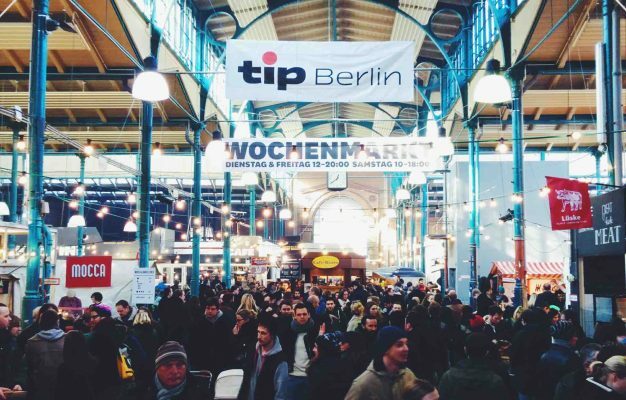 You might think that Berlin is a meat wonderland with an artisanal butcher around every corner, supplying neighbours with massive sausages and pork knuckles. Unfortunately, that’s far from true. 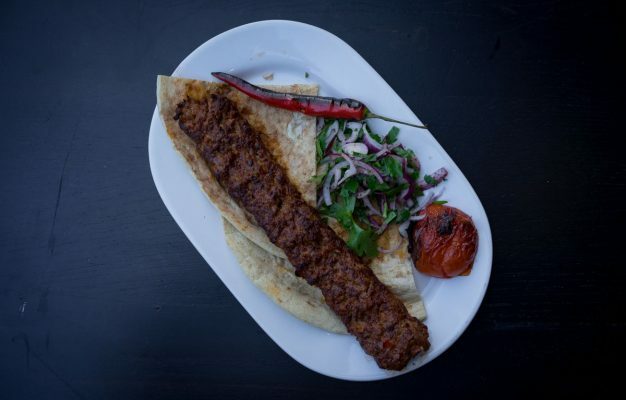 Small-scale meat production and private butchers have been pushed out of the market by industrial scale meat production over the last decades and Berliners usually buy their meat at supermarkets. 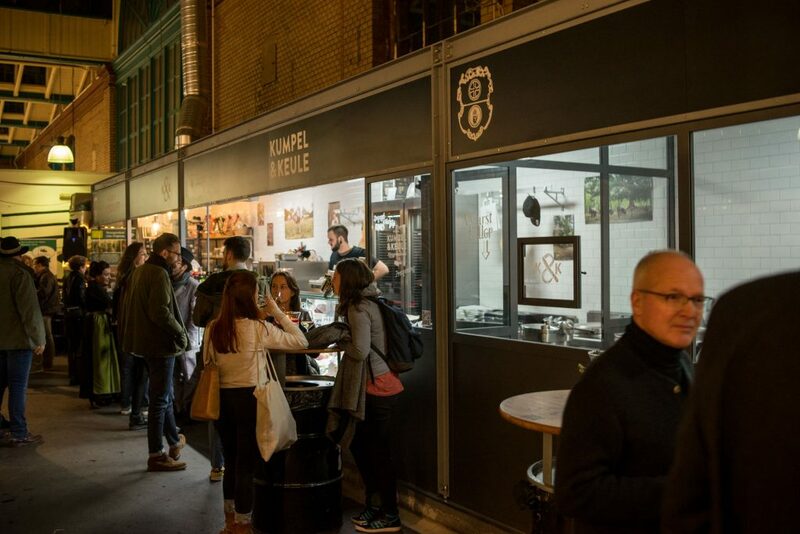 Meet the gang from Kumpel & Keule who are on a mission to change that. 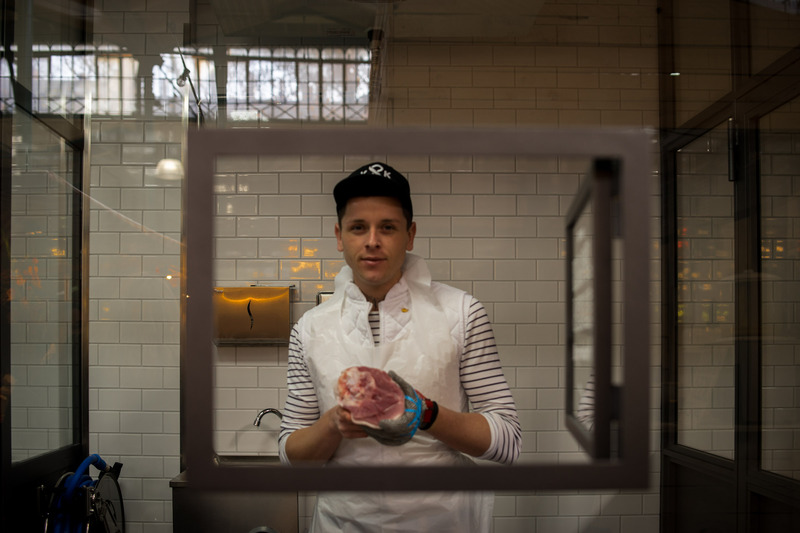 In the course of the last half of 2015, the two founders Jörg Forstera (youngest butcher-Meister of Germany) and Hendrik Haase (aka food activist “Wurstsack“) built their brand new butcher shop in the Markthalle Neun using lots of glass walls that leave no space for secrets. 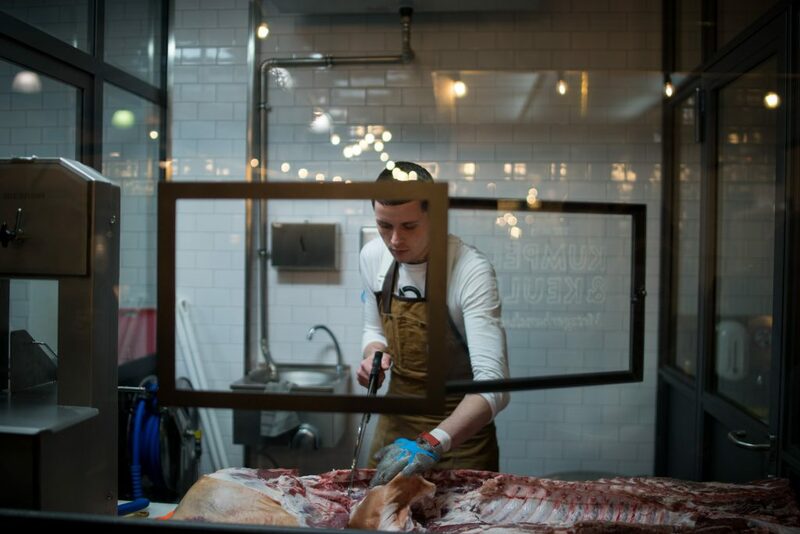 Because Jörg and his punkish-looking and extraordinarily young butcher crew do not only let you watch them at work, breaking down animals and making sausage, no, you’re in fact strongly encouraged to do exactly that. These guys have nothing to hide and very much trying to make a point. 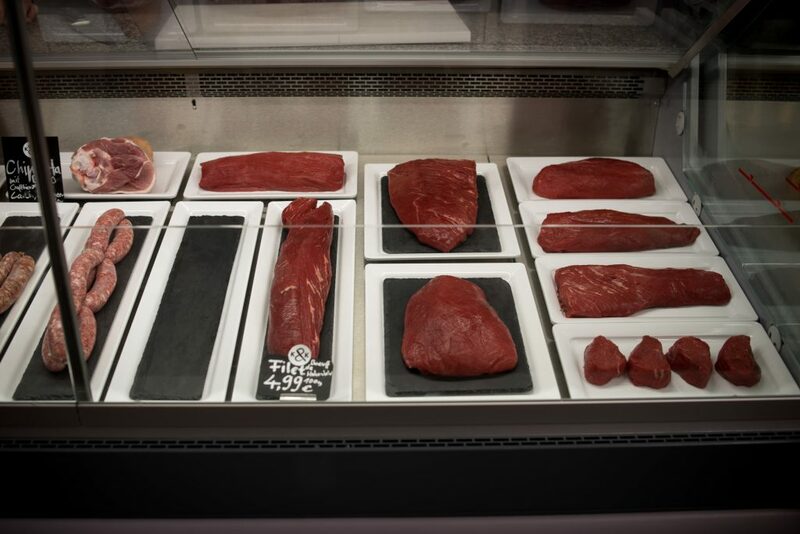 The art of butchery should not be hidden from the public but instead be public to everyone. 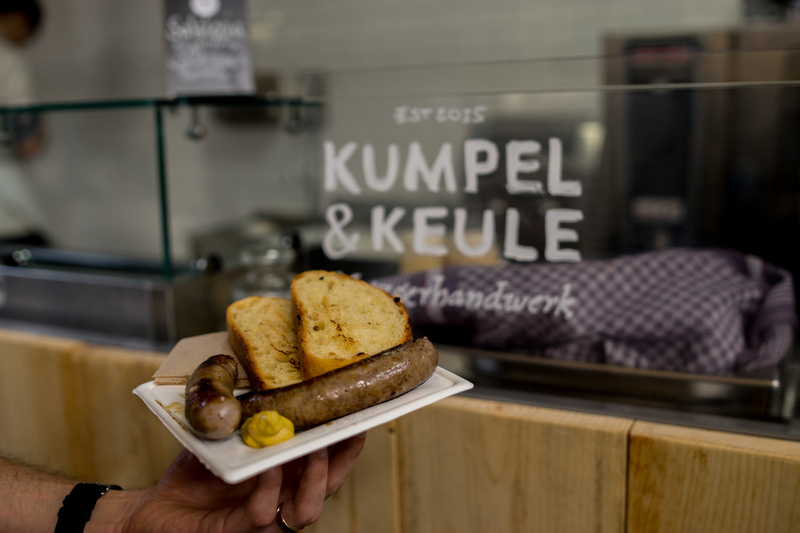 Kumpel & Keule is still very much an early stage project, but their meat selection is already quite impressive. They try to source as much of their products as possible from the region, but also only where it make sense in terms of quality. I’m not here to tell you where to buy your meat though. Because the most exciting thing about Kumpel & Keule is not the meat you can take home, but the meat you can eat right in the Markthalle. Kumpel & Keule have a grill section on the far left and they will throw on anything in their display to grill for you. Eat your way through their divine selection of fresh sausages, ranging from classic German varieties like Bratwurst and Currywurst to seasonal creations like Merguez and Salsiccia. Sometimes you can also enjoy a killer Leberkäs-Semmel or specials like red-wine braised oxcheeks. 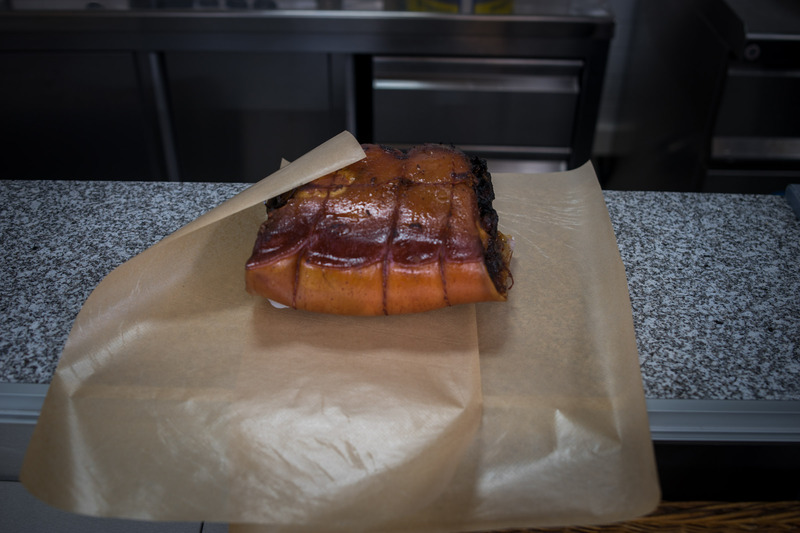 The menu at Kumpel & Keule changes every week but you can also just point at anything in the display and they’ll chuck it on the grill for you. Why not enjoy a juicy pork chop with some salad? Or have them grill a massive, dry-aged steak for you? The sky is the limit at this butcher shop. 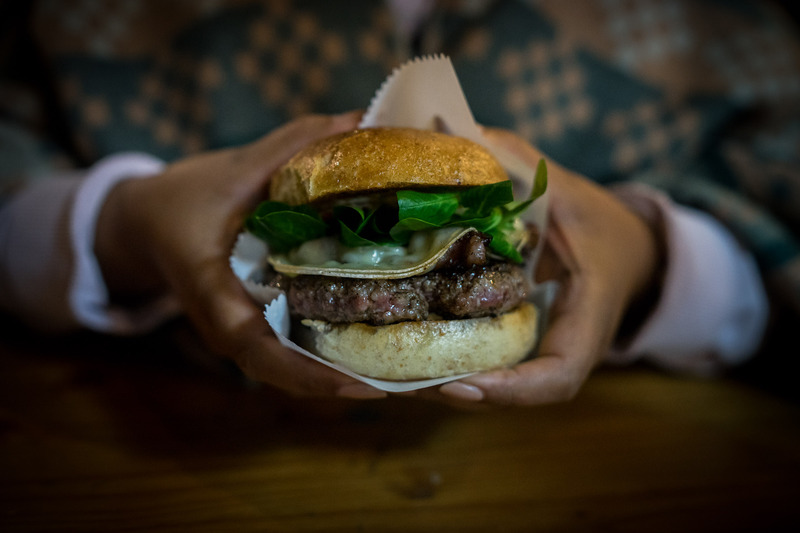 And if that doesn’t satisfy your meat cravings, the amazing new Kumpel & Keule burger just might. Made from trimmings of their dry aged beef and squeezed in a custom-made bun from Sironi Bakery and bacon from Big Stuff BBQ, this baby is slightly unconventional but also damn delicious. 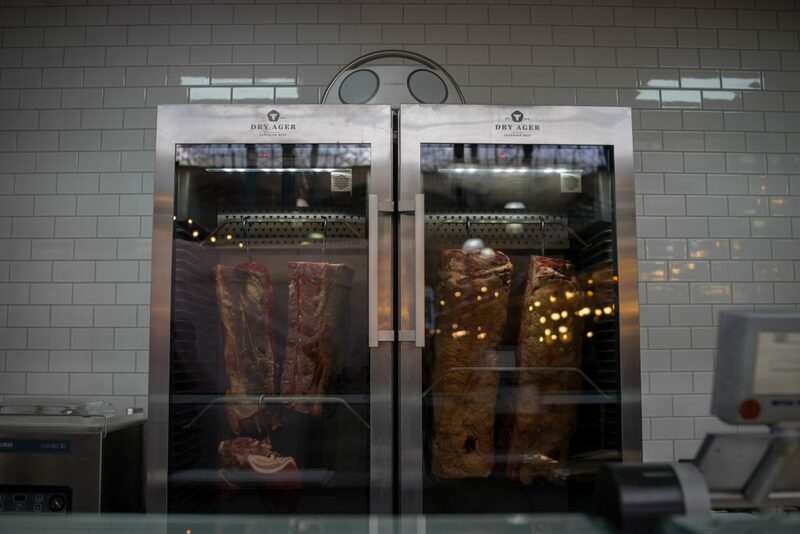 The opening of Kumpel & Keule elevates the whole Markthalle Neun to new heights and in a country with so many wonderful traditions around meat production it’s imperative that the trend of artisanal butcher shops closing is reversed. The crew from Kumpel & Keule are role models, injecting life into the quality meat movement. Best case they inspire a new generation of Berlin butchers to open up new shops. And in the meantime, you can eat the delicious food at Kumpel & Keule. That’s a proper win-win in my world.